Supermarkets have been accused of exploiting a loophole by using excessive and unnecessary plastic bags for click and collect and delivery services despite vowing to curb the practice. Customers of four of the UK’s largest supermarkets have complained that disproportionate numbers of bags are regularly used to pack their shopping, often packing just one item per bag and sometimes even when they have specifically ticked “no bags” at the online checkout. Environmental charities accused the retailers of failing to take public outrage over “pointless plastic” seriously. Paul Morozzo, ocean plastic campaigner for Greenpeace UK, said: “Supermarkets claim to be concerned by the plastic tragedy befalling our oceans, and responsive to the outrage from the public. Ever since new legislation was introduced in 2015, large shops have been required to charge 5p for all single-use plastic bags. But Sainsbury’s, Tesco, Asda and Ocado are all accused of delivering goods in carrier bags without charging customers a penny. Customers opting for a bagged delivery are charged a flat 40p fee, to match the average shopping requirement. However, this online loophole has seen some customers receive as many as 20 bags and many customers complain about getting one item in each bag. The St Madoc Centre in Swansea said it ordered 20 bottles of wine from Tesco for an event and each one arrived in its own plastic bag. “What’s the point of charging 10p per bag in-store to reduce plastic use but then sending these out?” it said. Another accused Tesco of delivering his shopping with four bags, despite opting for no bags “and one questioned why Tesco had delivered his click and collect shop containing 63 items in 34 bags, stating he was “far from impressed”. One complained about having £60 worth of Tesco shopping delivered in 20 plastic bags, with several items packed individually in separate bags and four frozen items packed in three bags. 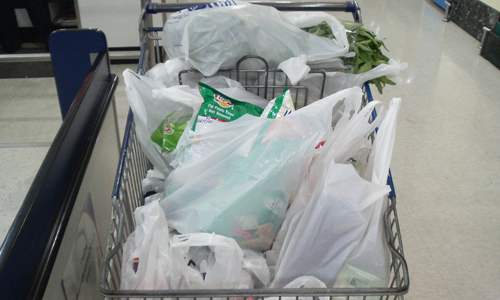 Other customers have received individual vegetables in separate bags. In April, every major supermarket in Britain pledged to eradicate unnecessary single-use plastics by 2025, under a new “UK Plastics Pact”. The government announced in July that plastic bag sales in England’s ‘big seven’ supermarkets had dropped by 86 per cent since the Government introduced its 5p plastic bag charge in 2015, helping to tackle the devastating impact of plastic waste on our environment. Figures revealed that customers of the country’s biggest supermarkets bought nearly a quarter fewer plastic bags last year compared to 2016/17 – a decrease of nearly 300 million bags. But campaigners warn that much more can be done. If requested, delivery drivers for Sainsbury’s and Tesco can take away and recycle any unwanted bags. Sainsbury’s said they appeared to be “isolated incidents” and said it was not aware of any issues. Ocado operates a highly successful carrier bag recycling scheme, offering customers a financial incentive to return bags, that results in around 87 per cent being returned.